Is it a structural problem? Our highly qualified independent surveyors carry out Specific Defects Reports on many property problems such as severe dampness, woodworm, dry rot, wet rot, condensation, cracking and/or movement. We also carry out structural surveys, known as residential building surveys and also commercial survey reports, together with property valuations (Note our valuations are not for bank lending but are to advise you how much we feel the property is really worth). We are more than happy to send you example surveys. Free phone us on 0800 298 5424 to speak to a surveyor. Cracks in my property, what is the cause? We deal with many cases of cracking in properties and the main question everyone wants to know is, is it structural cracking and is the property moving? Also, of course, along with how much will it cost to put right. This depends on many factors, but we thought we would give you an example of the type of problems we have come across in the past, where there are cracks to plaster. Cracks to the plaster, is it structural? In this case, the owners had been in the property about a year and had noted that the plaster was starting to crack and the cracks were everything from horizontal to vertical to diagonal cracks. Some rooms had one or two cracks, some rooms had many cracks. Mostly to the plaster work but there were some also to the door arcatraves and the skirting and understandably they were getting concerned about what could be the reason for the plaster cracking. Before we go into more detail about the reason behind the cracking we need to give you a bit of information about the age the property. This is exactly how we would work if we came round to look at your property. We firstly look at the property as a whole and gather information in relation to its age and construction and the various alterations that have been carried out to it. For example, with this property it is a late Victorian semi-detached property, with a nice large bay window to the front and a smaller bay window to the rear. It has been altered very little internally over the years, with the exception of adding in a bathroom. The owners started redecoration and refurbishing the property and started to notice the cracking to the plaster. They were uncertain whether there was any cracking there originally, but they did feel there were more cracks now. Whether this was because it was the first time they had looked closely at the room when they came to redecorate or not we will never know. One of the first things to understand is that the cracks are an effect and you need to understand what the cause of the cracks could be. This normally involves the building surveyor or engineer looking at various options, i.e. if this property was on a sloping site and was also in a clay area this would mean that when it rains the rain will want to go from the top to the bottom of the sloping site and usually the house is in the way. It is how the house copes with this rainwater travelling from the top of the rear garden to the end of the front garden. In this case, the water is clearly running along the side of it, as we could see moss, etc. 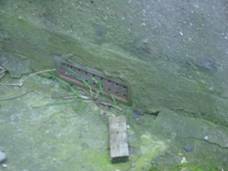 What we also noted was that the air bricks, that are meant to vent the property under the floor, were at ground level and were therefore allowing the water to get in, very much like a gully. This therefore could affect the structure and cause hairline cracking, particularly as it is in a clay area. We won't go into the details of how clay works, but what is essential to know is that clay expands and contracts dependent upon its water content and is one of the main causes of subsidence, along with trees. Each could cause cracking to the plasterwork and together the combination is doubly likely to cause cracking. From what we could see this problem was only to the rear part of the property and we decided that it would be best if we lifted the floorboards in this area (with the permission of the owner) and we duly lifted these to find a relatively dry area. 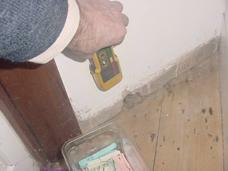 We did use an electronic damp proof meter, which did show some dampness, but not as much as we expected. We continued our investigations as we felt this was one factor that needed consideration and there could be other issues. The reason why we lifted the floorboards up was to see how damp the floor was underneath, particularly the rafter feet that support the main floors, where commonly rot is found. We do literally look from top to bottom when carrying out these reports. We next looked in the roof space. This is because we noted that the original slates on the roof had been replaced with a heavier concrete tile, which can cause problems to the roof structure and the walls below, known as roof spread. When we got in the roof (which interestingly enough the owners had a survey carried out when they brought the property and the surveyors said they were unable to get into the roof. What they actually meant was it was awkward and they certainly would have been able to get in it without too much effort. Therefore, the important thing to remember here is pick the right surveyor to carry out your survey and make sure that they will make every effort to get in the roof space. Most importantly, meet them at the time they are carrying out the survey to have a walk round and chat with them), we examined the roof structure to look for signs of movement and we concluded that whilst today, under current building regulations, extra timber support would be required. This roof structure had stood the test of time and there was no movement to be seen. This therefore ruled out roof spread. The next area where we thought there may be a problem was the front and rear bay windows. As often bays were built with very little foundation movement can occur, often with them moving away from the property and this in turn can cause movement in the structure as a whole. In this case, whilst we could see, when we were in the roof space that some dampness was coming in underneath the valley gutters, where the bay window roof meets the main roof we could see very little actual movement. What problems does cement mortar cause? We noted that the outside of the property has been repointed in a cement mortar. Originally it would have been built with a lime based mortar. This is what should have been used for any repointing. The use of a cement mortar in this case has caused the deterioration to the brickwork in the form of spalling, which in turn leads to dampness in the structure, which can be a very important element and cause of movement, particularly if it is around a timber lintel or a bonding timber. Certain pointing, as well as causing aesthetic problems, can also cause structural problems, allowing rainwater into affect and damage the timber lintels and the bonding timbers. In this case, however, this wasn't a problem. Finally, we looked at the plastering once we had assessed the structure as a whole. Whilst this isn't a full and comprehensive list of what we look for, we hope it gives you an idea of the sort of things that we can help you with. We could see from the plaster surface it was relatively smooth, indicating that it was a modern plaster, rather than the older/original lath and plaster. The modern gypsum plasters have very different properties to the older lime based lath and plaster. We concluded that the plaster was made up of the original lath and plaster with a skim coat of modern gypsum plaster, probably anything from five millimetres to fifteen millimetres thick, over the top of it. These two plasters have very different properties, which we believe has led differential movement, which in turn has caused cracks in the plaster. This has been added to, and aided by, dampness that has got into the property. The aim of this article is to give you a good idea of the sort of investigation work we carry out as building surveyors on a property. We hope it has been of interest to you. One last thing that we would comment upon is to be careful of free surveys or free advice, as often the person is trying to sell you something. My property has been repointed in a cement mortar, what can I do? 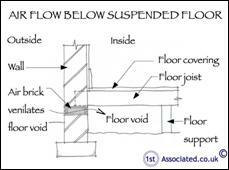 Why have one of our independent building surveys? We always recommend you have an independent building survey as this will highlight any property problems such as cracking. Caveat emptor means buyer beware and is why you need to have a building survey to find out if there are any problems within the property. We have developed our surveys over many years, in fact several decades. We have listened to feedback from our clients and amended and altered our surveys to make them easy to read and describe issues clearly. The key factor we believe is that our surveys are easy to understand in plain English. Throughout our reports we use many photographs and surveying sketches to make the reports as clear as possible. We literally have commissioned hundreds of our own survey sketches developed over many years depicting various property issues including cracking. We also use circles and ovals on our photographs (like the example photo we show here) and sketches to emphasise problem areas so that you are not left wondering what the problem is. If you have a commercial property, be it leasehold or freehold, then you may wish to look at our Dilapidations Website at www.DilapsHelp.com and for Disputes go to our Disputes Help site www.DisputesHelp.com . If you have any experiences that you feel should be added to this article that would benefit others, or you feel that some of the information that we have put is wrong then please do not hesitate to contact us (we are only human).